Home > Forum > Triathlon Forum > Drilling holes in carbon extensions???? Drilling holes in carbon extensions???? Can this be done safely? Looking at some carbon extensions that don't have exit holes for cables other than at the back. My first reaction is no don‘t even think about it. My second reaction is, but that‘s not an advise but purely a thought what would I do MYSELF: If the cross section is identical over the length of the extension, and if would have to make a hole, I would drill it near the end because there the bending moment is the smallest. Of course you would have to lead your cables all along the outside of the extensions. But as I wrote: I do not know how carbon reacts after drilling: you are going to cut carbon fibers which also weaken parts adjacent the holes. The answer to "can I?" and "Should I?" might not be the same. If it is a location that is not under load (like the tail that sticks out the back of the clamp) it would probably be OK, but if it is somewhere under load, drilling the hole is going to weaken it. There is also the problem of the carbon delaminating where the bit comes out. I drilled oval-shaped exit holes in my carbon extensions for Di2 cables. I have not died yet. I would do it again... Extensions are relatively thick-walled and strong because they manufacturers do not know where they will be clamped. I positioned my exit holes between the clamp points, so risk of failure due to excessive stress in that area is relatively low. I'm trying to get my hands higher. I was thinking thinking the high rise extensions like USE. 20° pad wedge and 40° high rise extensions? Do u feel like the bike handles sketchy with your hands that High? The hole is in an area of almost zero stress, so the only real issue would be crack propagation from poor drilling. The same hole just forward of the clamp would likely be a disaster (highest stress point). I'd say you are fairly safe if the exit holes are significantly behind the basebar clamp (no moment arm and far enough back from the clamping stresses that could cause cracking), and up next to the shifter (also a low stress area). A lot can go wrong drilling composites (esp w/o subsequent reinforcement), that's why most hole are moulded in. Be careful...I cant speak to every extension but we did go through multiple iterations in the SHIV development to implement the windows you see on the new carbon extensions. The hole and resulting stress concentration is 1 thing, but the broken fibers from the drill are another. Molded holes and drilled holes behave much differently. An extension that is not reinforced at the hole can have problems. This clip has nothing to do with drilled extensions. 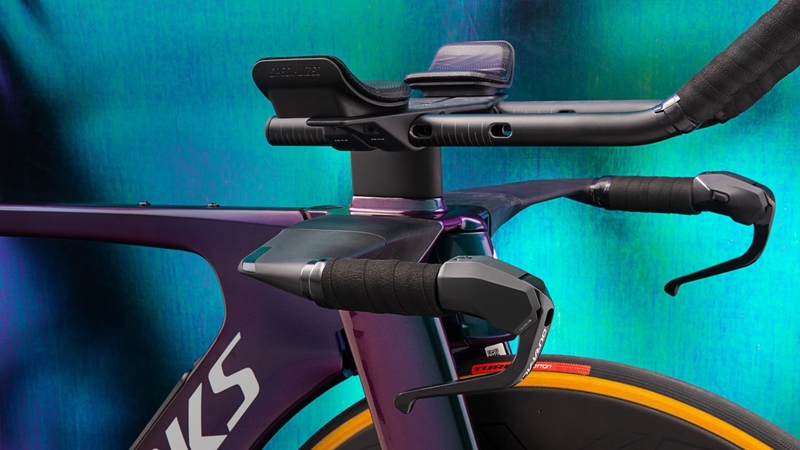 It is documented that this crash happened because the contracted mechanic installed too short of bolts through the aerobar risers. I drilled the S-bends for my second gen Speed Concept. I have eTap and wanted a hole where the blip mounted... drilled two clean holes and no issues. At that end of my extensions I don't really foresee any issues. I'd be more heistant if it were a mounting point/clamp area.